Close-up of the land mine field in the water/ice test bin, with Millitech/Telaxis Building I is in the background. 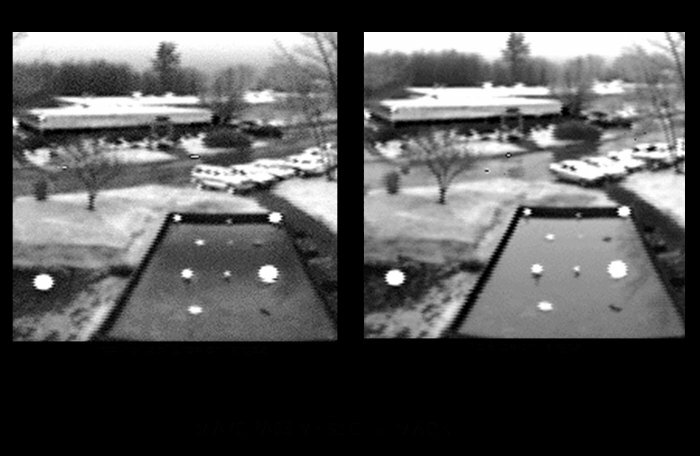 Snowstorms have negligible effect on passive millimeter wave images at 95 GHz. Circular metal calibration plates were interspersed throughout the mine field. The three targets in a horizontal line midway in the bin, and the two at either corner in the back, are calibration targets. All others are land mines provided by special ops. Credit: Photo courtesy of Doc Ewen.